Last Updated: September 22, 2015 | Subscribe to our weekly newsletter! I’m sure you have heard the term hard water thrown around by plumbers or even on television during the commercial breaks for your favorite shows. But have you ever taken the time to learn what is and how it can impact your plumbing in your house and, more importantly, your pool? I didn’t think so. Maintaining the proper calcium hardness level in your pool is essential to you maintaining proper water quality and reducing the chances of your water corroding the plumbing in your pool or causing a scaling build up on the surface of your pool. 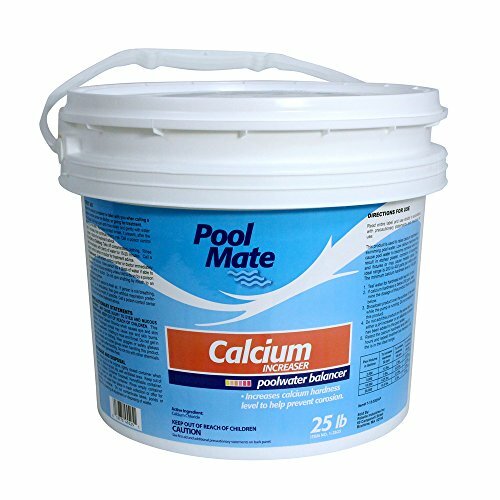 Calcium hardness is the measure of how hard or soft your pool water is, and how much calcium is dissolved in your pool water. Ideally, you should strive to have your calcium hardness levels at 150 – 400 ppm with your ultimate goal being to try to keep it right in the middle of that figure. If you stray too high or too low from that goal, your water will become too soft or too hard which could lead to problems down the road. 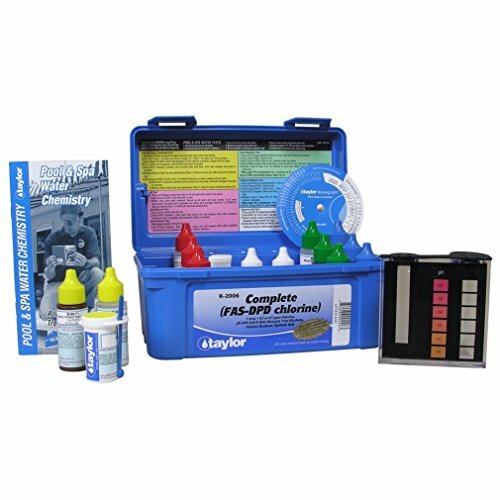 Unlike your standard water chemistry tests checking the pH and alkalinity levels of your pool, calcium hardness does not need to be checked quite as often. It is usually recommended that you check the hardness levels every one or two weeks depending on the quality of the water in your area and how often you have to refill your pool. Test strips usually don’t cover calcium hardness, so your best bet is a liquid test kit If you click this link and make a purchase, we earn a commission at no additional cost to you. . If your water has become too hard, it can result in cloudy pool water that you just can’t seem to clear up no matter how much pool shock If you click this link and make a purchase, we earn a commission at no additional cost to you. you add. At the same time, it can also lead to the build-up of calcium sediments on the sides of your pool and even inside the plumbing of your pool. If your water is too soft, meaning the calcium hardness levels have fallen below 150 ppm in your pool, the water will become corrosive. When it does, it can begin to dissolve the concrete and begin to corrode metal in your pool resulting in potentially expensive pool repairs down the road. In order to bring the calcium hardness into proper balance in your pool, there are a few steps you can take. Clean your pool. Before you begin your tests, go ahead and clean your pool thoroughly to remove any contaminants from it. Balance your water chemistry. Before you tackle the hardness of your water, you must first bring the pH and Alkaline levels into proper balance as the chemicals you use to balance these levels can affect your calcium hardness. If your water hardness level is above 400 ppm, you will need to lower the calcium hardness level, if it is below 150 ppm, you will need to raise it. Raising hardness levels is often much easier than lowering the levels. To raise the hardness levels, simply add a calcium hardness increaser If you click this link and make a purchase, we earn a commission at no additional cost to you. to your pool. Be sure to follow the instructions on the package carefully for the size of your pool in order to obtain the best results. There are several steps you can take to lower the hardness level of your pool water. If your water isn’t hard, you can drain a portion of the water from your pool and replace it with your softer water. If replacing the water isn’t an option, you can use a flocculant If you click this link and make a purchase, we earn a commission at no additional cost to you. to attract the excess calcium and cause it to clump. After you use the flocculant, clean the walls and floors of your pool to remove the excess calcium and then backwash and clean your pump filter. If none of these options work, you can also try adding an acid such as dry acid or muriatic acid If you click this link and make a purchase, we earn a commission at no additional cost to you. to raise the saturation levels. While this won’t reduce the hardness of your water, the rise in saturation levels will bring your water back into balance. Maintaining properly balanced water is one of the most difficult parts of owning a pool. The calcium hardness levels in your pool can often prove to be particularly troublesome to some pool owners especially if their water source is already hard to begin with. 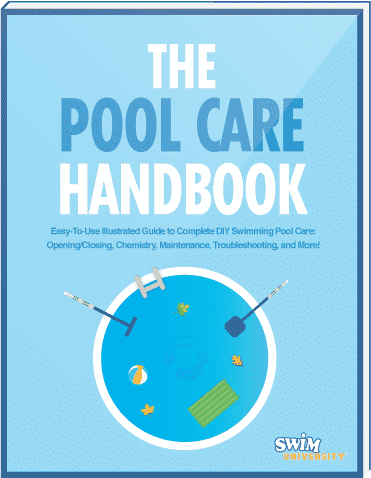 However, with a little time and effort on your part and the addition of just the right chemicals, you can bring your calcium hardness levels to within acceptable balanced levels so you don’t have to worry about water corroding your pool or calcium buildup along the walls and in the plumbing ever again.